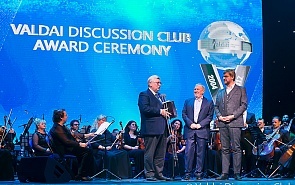 The Valdai Award ceremony took place on October 16, 2017, as part of the XIV Annual Meeting of the Valdai Discussion Club. The Award recognized the outstanding contributions to the interpretation and promotion of the understanding of changes that are taking place in global politics through academic papers, public appearances or research and education projects on key global development issues and international relations. Both individual authors and teams/expert groups can become winners and laureates of the Award. Follow this link to find out more about the Award.